DaiQuan's Blog: Review: "Batman V. Superman: Dawn of Justice". Review: "Batman V. Superman: Dawn of Justice". Three years after Zack Snyder's highly divisive "Man of Steel", which was the first chapter in the DC Cinematic Universe, we pick up again with legendary characters, both new and old to the big screen, as they're adapted from the extensive DC Comics stable for "Batman V. Superman: Dawn of Justice": The on-screen universe's sophomore effort on the road towards the highly anticipated "Justice League" crossover film that's set for release next year. As with anything else that Snyder has done in his filmmaking career though, "Dawn of Justice" has proven to be just as controversial as his previous work was before it. So, with all of that out of the way, here's my review of the latest DC film installment! The story opens with two cold-openings. The first: A flashback to the iconic deaths of Thomas and Martha Wayne (played well by dual "Supernatural" and "Walking Dead" alums Jeffrey Dean Morgan and Lauren Cohan) thirty-five years ago in Gotham City's notorious crime alley at the hands of a mugger while their young son Bruce looks on at the tragedy, a defining event that traditionally changes him for the rest of his life. The second: A flash-forward soon afterwards to Metropolis thirty-three years later as Bruce, now a grown man (played by Ben Affleck), is forced to look on as his city's twin is destroyed in the wake of Superman and General Zod's god-like combat, as covered in 2013's "Man of Steel". The unintended consequences of superheroics feel real here, unlike in most other comic book films, and the realization that Bruce has lost most of, if not all, of his company's Metropolis-branch employees to what's essentially an act of terrorism weighs down heavily on the audience and makes a convincing argument for Batman's point of view against the alien: Superman. The story truly begins in the first act where we pick up a year and a half after the events of "Man of Steel" with Lois Lane, played once again by Amy Adams, as the iconic character finds herself in the middle of some sort of turmoil. This time she's been kidnapped by a Boko Haram-like terrorist organization after their swift and brutal slaughter of her crew. It's not long until Henry Cavill's Superman classically flies on to the scene from above, leaving a vintage sonic boom behind him on his trail. The Man of Steel saves the day, as per usual, but not without controversy this time around. When the couple returns home to the United States, Clark Kent and Lois Lane are surprised to learn that Superman has been accused of murdering the African village where Lois was kidnapped. This accusation, while obviously false and scoffed at by an unconcerned Clark, serves to fuel a large portion of the public's distrust of Superman while posing the important question about the character in general: While traditionally portrayed as appreciated by the world's populace, would we be just as grateful to him for solving all of our problems in the real-world? Probably not, according to the film, and convincingly so. At one point in the film, we're treated to a deeply touching scene where Clark consults his adopted mother Martha Kent (Diane Lane) about his optics issue with the fearful people of Earth. She convinces Clark to go all-in as a hero instead of quitting altogether to live an average life with Lois but while following his mom's advice by saving countless innocents around the world in a montage scene, numerous clips from the media feature stubbornly contrary talking-heads like Senator Finch (played by Holly Hunter of "Saving Grace" and "Raising Arizona" fame) and Dr. Neil deGrasse Tyson, amongst others, and neither are as particularly praiseworthy of the Kryptonian hero as one would usually expect after becoming familiar with other incarnations of the "Superman" mythology over time. The story does itself a favor by setting up the impending and inevitable titular showdown between Batman and Superman by pitting their respective alter-egos, billionaire philanthropist Bruce Wayne and newspaper reporter Clark Kent, against each other at an exclusive fundraiser held by Lex Luthor (played by Jesse Eisenberg). The vital scene acts as the film's first mission statement and finds Clark intellectually challenging Bruce to a war of wits after the former had already been instructed by his Editor-in-Chief boss Perry White (played by the returning Laurence Fishburne, this time around with noticeably more personality) to drop his investigation into the famous "Bat of Gotham" acts of vigilantism in Gotham City, which stretch back for twenty years in this story. Additionally, there's a stark dichotomy between Bruce and Clark's respective mindsets about the topic of vigilantism which demonstrates exactly what makes their legendary relationship so interesting in a general sense but more-so in this story where Bruce is cynical about what he feels is futility concerning the capacity for goodness within people after being worn down by Gotham's underworld over the course of two decades, whereas this version of Clark is still optimistic, or at least hopeful, about the future of humanity due to the encouragement of his mother Martha and girlfriend Lois, his deceased father Jonathan's belief that the course of the world would be drastically effected by his very own decisions, and in memoriam of the thousands who perished during his battle with Zod in Metropolis nearly two years prior. The scene plays out very well, overall, and it's made more interesting because of the clues that Bruce drops concerning his former rogues gallery in comparison to Clark's ever-growing one; Bruce plays the disillusioned veteran while Clark plays the naive rookie who's in for a rude awakening, and the roles fit them very well. Meanwhile, we're introduced to the beautiful and mysterious antiquities dealer Diana Prince, played by Gal Gadot. Her initial interactions in the film are with Bruce Wayne and the chemistry between the two characters are convincing enough to make us believe that there could be more between them romantically down the line. Independently, though, we learn of Diana's true motivations for attending Luthor's event and that is revealed upon Bruce's retrieval of Lex's personal files later on when it's revealed, amongst other secret files on the rest of the future Justice League members, that Diana was captured in an irrefutable photo while dressed in her Wonder Woman gear from World War I in 1918, appearing as young then as she does now. On another note, Eisenberg's Lex Luthor does a good job of being the bad guy of the story. If the job of a villain is to make the audience hate you then Eisenberg did well in that regard. It's his character who pushes the story along on a routine basis: The first example of this is when Lex, obsessed with defeating the most powerful being that he's ever seen, murders an entire committee on Capitol Hill that was chaired by Senator Finch, who refused to work with him on an exclusive deal to manufacture kryptonite-laced weapons, as well as his own personal assistant Mercy Graves. The second example led the story into its climax when Lex executes the plan he'd contrived to kill Superman by kidnapping both of the women in Superman's life, Lois Lane and Martha Kent, in hopes of pressuring him into a death match with Batman. This is where the film draws the first part of its title from. The big fight between Batman and Superman had been one that fans always debated over, wondered about, and simply wanted to see on the big screen. And it didn't disappoint, at least not to me. Batman popularly inquires of Superman about if he's capable of bleeding at one point in the story and he got his answer rather quickly by outwitting the Man of Steel and outmaneuvering him, as well, with advanced weaponry and kryptonite bombs - all the while as Superman pleaded with him for assistance in saving his mother Martha Kent, whose first name struck a convenient chord with Bruce since his very own mother, now many decades deceased, once shared that namesake as well. Batman comes to his senses, clearly having won the fight, and pulls back from delivering a deathblow to Clark with a kryptonite spear. He decides, instead, to partner with the Man of Steel against Lex Luthor and takes on the task of saving Martha Kent from Luthor's henchmen in memory of his late mother Martha Wayne. The ensuing fight between Batman, with the technical assistance of Jeremy Irons' well-portrayed and wise Alfred Pennyworth, against the mercenaries stands out as one of the film's silver linings: It's aggressive, well-choreographed, and does wonders for Batman's redemption arc from that point onwards once Martha is successfully saved. The story takes its penultimate turn when Diana Prince returns to the fold by prematurely leaving her flight after witnessing Batman and Superman's struggle against Lex Luthor's amalgamated monster Doomsday on live television. 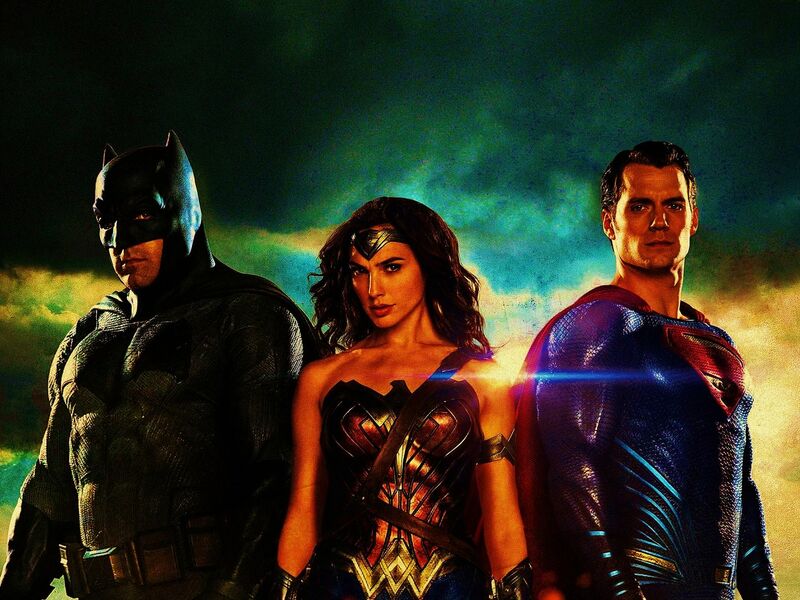 The heavily-promoted image of DC's live-action Trinity uniting for the first time should've been one that didn't work after months of heavy rotation in the media but it actually did when viewed in the context of the film and served as the second part of the film's title. Without a doubt, Diana - in full Wonder Woman gear - joining the big boys on screen for the first time after seventy-plus years in existence alongside them spelled out this universe's titular "Dawn of Justice": An era where heroes will reign supreme in the new DC Cinematic Universe. However, tragedy follows this regal event when Superman says his final goodbye to Lois and wins a Pyrric victory against Doomsday by stabbing it in the heart with Batman's kryptonite spear, killing the monster, while Wonder Woman held it down with the Lasso of Truth and Batman shot it with a kryptonite bomb.... but not before Doomsday could deal a killing blow to Superman by stabbing the hero in the heart with one of his bone protrusions. The film ends with Lex in prison with his head shaved bald as per his signature comic book look by way of prison policy, Bruce and Diana vowing to form the Justice League in the wake of Superman's death in order to protect the world in Superman's absence, Lois receiving a posthumous engagement ring from Martha Kent on Clark's behalf, and two simultaneous funerals: A token one for Superman in Washington, D.C. and an actual one for Clark Kent in Smallville, Kansas where Lois drops a handful of soil on Clark's casket. The dirt that she dropped begins to levitate upon her departure and it signifies Clark's obvious survival (or resurrection) ahead of next year's highly anticipated "Justice League" film. In a world where a man possesses immeasurable power, a woman can't die, and another man beats down whomever he feels like while dressed up as a bat, it's hard to imagine the public's response to these characters as being anything else outside of fearful in the real world. Zack Snyder understood this fact and took an obvious page out of one of his very own previous adaptations: Alan Moore's "Watchmen". Superman substitutes for Moore's Dr. Manhattan here in terms of controversial public perception and Batman substitutes for Rorschach in terms of championing the moral fight against what he feels is an absolutely powerful man who can easily be corrupted absolutely, in this case Superman. Another great example of Snyder's realistic approach to these characters is Martha Kent's advice to her son Clark when she's consulted: "Be their hero, Clark. Be their angel, be their monument, be anything they need you to be. Or be none of it. You don’t owe this world a thing, you never did. "; Her advice to her son, like that of her late husband's in this incarnation, may sound contrary to what we've come to expect in comparison to other incarnations that we've come to know but when dissected, the advice is as positive and powerful as it possibly could be because it encourages full commitment from what's basically God on Earth. It's supportive advice like his mother's and the encouragement from his girlfriend Lois when he's feeling under pressure, that keeps the Man of Steel pure and from crossing the line of nonchalance that Manhattan did in "Watchmen". "If God is all-powerful then he cannot be all good, and if God is all good then he cannot be all-powerful," proclaims Jesse Eisenberg's Lex Luthor. Whereas comics traditionally portray the concepts of right and wrong at face value, it's a breath of fresh air to witness the material treated with three-dimensional depth by questioning societal norms the way it did in "Dawn of Justice". The tactic does wonders for the realistic approach that Snyder worked hard to establish between "Man of Steel" and this film. Many hints, cameos, and easter eggs are dropped in this film. Everything ranging from Lex's personal files on the future Justice League members, to the hint of Darkseid's impending arrival, to Joker's past mayhem in Gotham preceding the film, and Wonder Woman's influence on world history. Collectively, they do much to progress the idea that we're out of the era of pocket-universe solo storytelling for DC characters and entering an ambitious brand new shared universe where everyone and everything is connected: The way it should be, the way it is in the comic books. The world-building in this story works and it does what it sets out to accomplish as an opening act for "Justice League, Pt. 1". Therefore, it was a successful ingredient of the story in my eyes. "Batman V. Superman" borrows much from it's source material: Frank Miller's "Batman: The Dark Knight Returns" for Batman and Superman's big fight, Brian Azzerello's "Superman: For Tomorrow" for Metropolis' healing after a major tragedy, and Dan Jurgens' "Death of Superman" for Superman's demise at Doomsday's hands in the film. Where DC's main competitor, Marvel Studios, choose to adapt their projects by adapting the correct tone from the comics instead of specific storylines, Snyder's choice to combine numerous storythreads that were originally told in the comics made for a great trip through memory lane for avid comic book enthusiasts such as myself. Featuring amazingly choreographed hand-to-hand combat sequences, huge explosions, creative use of superpowers, and high personal stakes for its characters, "Dawn of Justice" shines the brightest when it's allowed to forgo its own aspirational hopes of achieving high artistry by letting loose and having fun. You'd be hard-pressed to find an action scene in 2016 (so far) that could send chills down your spine more than Batman's fight to save Martha Kent from Lex's henchmen in this film. Also, I enjoyed the smugness of the vindication that I felt while seeing Batman defeat Superman at the conclusion of their big fight. Not because I necessarily love Bruce more than Clark, which I don't, but because it was an outcome that I predicted a couple of years ago upon learning of the project's development. Having Batman win the fight here in his first appearance in this Cinematic Universe cemented the character as a strong force to be reckoned with and was the only logical route to go in order to make the Caped Crusader the intimidating being that he should always be. I'm glad that it worked out this way because the character deserved the strong opening. Featuring a stellar all-star cast, none of them disappointed me in this film. Everybody had their part to play and they played them well. Archetypally, it reads like a Roman tale: Henry Cavill plays the conflicted hero in Superman, Ben Affleck plays the disgruntled veteran in Batman, Gal Gadot plays the quiet observer in Wonder Woman, Amy Adams plays the faithful loyalist in Lois Lane, Laurence Fishburne plays the cynical everyman in Perry White, Diane Lane plays the supportive mother in Martha Kent, Jeremy Irons plays the wise mentor in Alfred Pennyworth, and Jesse Eisenberg plays the strategic villain in Lex Luthor. Perhaps most distinctive of them all though, would be Ben Affleck's praiseworthy portrayal of Bruce Wayne/Batman. Arguably the most iconic anthological role in Comic Book Film history, Affleck had much to prove by taking over the reigns from Christian Bale's phenomenal era as the character in Christopher Nolan's "Dark Knight Trilogy", as well as to bury his often-maligned portrayal of Matt Murdock/Daredevil from the 2003 movie which unanimously pales in comparison to Charlie Cox's version of the character in Marvel's Netflix series. Affleck's Bruce was cerebral, brooding, intimidating, and nihilistic. It was everything that this mature incarnation in this story required and I was very impressed by it. On another note, I feel a bit more impartial towards Jesse Eisenberg's Lex Luthor, though I appreciated his performance objectively. His portrayal wasn't the usual for the character, and it didn't necessarily need to be, but it was harder to gel with as a viewer and expert on these characters. However, the charismatic portrayal of Lex honestly did mesh well with the mad-scientist incarnation of the character from the 1940s and 1950s (which casual audiences are largely unfamiliar with) but I do feel that going the ruthless businessman route from the 1990s and 2000s would've fit this story's attempt at realism much better. When all was said and done though, Eisenberg's Luthor didn't ruin anything for me enjoyment-wise. Surely the biggest gripe that I had with this film was the fact that the ending puts Clark Kent, the alter-ego of Superman, in an almost impossible position to return again. Killing Superman, the super-powered being who's capable of miraculous feats, is one thing; Killing Clark Kent, a seemingly normal man in the eyes of the everyday person, is something completely different, it's nearly irrevocable. I feel that they put the Clark Kent persona on hiatus incorrectly because in this shared universe, which supposedly aims for realism, reporters shouldn't die and come back to life: It's extremely unlikely in real life and would compromise the integrity of the DC Cinematic Universe's believability if resolved with ease in a future installment. This was a misstep on the storytellers' parts and I wish they'd simply had Superman go missing and PRESUMED dead after the fight with Doomsday, this way Clark could simply be declared temporarily missing instead of permanently dead. This gripe of mine may change if resolved in the future in a sequel, surely, but it'll nag at me until then. Another issue that I had with the film was its lack of explanation for why the masses couldn't identify either Batman or Superman out of costume. We do see the photo of Wonder Woman from 1918 and its only reason for ringing suspicious in the story is because both Lex and Bruce have obviously identified Diana Prince out of costume. It's logical because she doesn't wear a mask. Meanwhile, in this story which takes place in the same universe with the same rules and logic, Clark Kent can hide behind a pair of glasses from anybody who isn't Lois Lane, and an internationally-known celebrity like Bruce Wayne can go unrecognized even though the entire lower half of his face is uncovered. I give the storytellers kudos though for introducing a voice-modulator for Batman to disguise his voice when he speaks but when other heroes in other media like Elektra can figure out Matt Murdock's identity as Daredevil over TV footage in the Marvel Cinematic Universe because of his revealing cowl, which is similar in structure to Batman's, then that flaw contradicts the stated realism of the universe that the story tries numerous times to uphold. Additionally, it gives DC's competition a leg-up on responsible storytelling. Hopefully this flaw will be rectified in a sequel too. When Lex uttered the word "Mercy" in reference to his personal assistant at the Senate hearing, I nearly jumped out of my seat with joy. Mercy Graves, like Harley Quinn, was always one of my favorite supporting DC characters from the animated series. Like Harry Osborn and Aunt May in the "Spider-Man" mythos, Mercy was a character that I always considered to be a staple in the "Superman" comics, especially the ones that I grew up with. She's lethal, intelligent, and suffers from serious Stockholm Syndrome for Lex. In other words, she's an interesting character to explore. However, she's treated like a fourth-rate extra in the film and is killed off without many lines, if any at all. Similarly, Zack Snyder confirmed in an interview that the unnamed photographer in the story who was swiftly killed in the beginning was basically Jimmy Olsen, another signature character from the "Superman" mythology. Both deaths spelled a lack of creativity and utter laziness to me when both characters could've been used in subplots or as MacGuffins, if not in this story than in future ones. These decisions, for whatever reasons they were made, seemed very short-sighted to me and were symptomatic of the powers-that-be not knowing what to do with some of these iconic characters, unfortunately. I really enjoyed "Batman V. Superman: Dawn of Justice". While it had several flaws, as any story does, none of them were potent enough to distract me from the bigger picture of what the film did correctly in more ways than it did wrong. The film set out to have Batman and Superman fight over opposing philosophies and to set up the groundwork for the Justice League in the DC Cinematic Universe; it succeeded in completing both of those objectives, and in considerably creative and convincing fashion. By the end of the film, I felt comradery with all of the characters on some level, was impressed by the action, and was moved by the drama at the core of the script. Why the mainstream critics bashed the film straight to Hell is a mystery to me but a small part of me suspects that three things were at play there: A) The critics couldn't see the beauty of the film because they were unfamiliar with the tone of it outside of solo "Batman" outings, B) They'd been influenced by the lighter tone of the Marvel Cinematic Universe films, and C) Because they weren't familiar with the comic book references and therefore couldn't appreciate the nuances of this adaptation. I think that the film will enjoy an admirable legacy, especially after the Director's Cut makes its way to release this coming summer, and I feel that folks will appreciate the vital part that this film played in laying the groundwork for what will surely become another vast and rich shared universe in pop culture. And without a single doubt, this was a definitely a project that I appreciated. Better Than: 2006's "X-Men: The Last Stand", "X-Men Origins: Wolverine", "X-Men: First Class", "Hulk", "Spider-Man 3", "The Amazing Spider-Man 2", "Blade: Trinity", "Elektra", "Ghost Rider", "Ghost Rider: Spirit of Vengeance", "Iron Man 3", "Steel", "Batman & Robin", "Catwoman", "Superman Returns", and "Green Lantern". Outshined By: 1978's "Superman", 1989's "Batman", "Watchmen: The Director's Cut", "Batman Begins", "The Dark Knight", "300", "Sin City", "Hellboy", "Blade", "Spider-Man", "Spider-Man 2", "X2: X-Men United", "X-Men: Days of Future Past", "Iron Man", "The Avengers", "Guardians of the Galaxy", and "Captain America: The Winter Soldier". On Par With: 2000's "X-Men", "Man of Steel" (it's own predecessor), "Captain America: The First Avenger", "The Amazing Spider-Man", "The Incredible Hulk", "The Dark Knight Rises", "Ant-Man", and "Thor". However, this film was good enough to keep me looking forward to more DC Cinematic Universe material, especially for August's "Suicide Squad" as an early birthday present to myself. And on that note, my review is concluded! Let me know what you all thought about the film and about my thoughts on it. Keep an eye out for more of my reviews as they come.